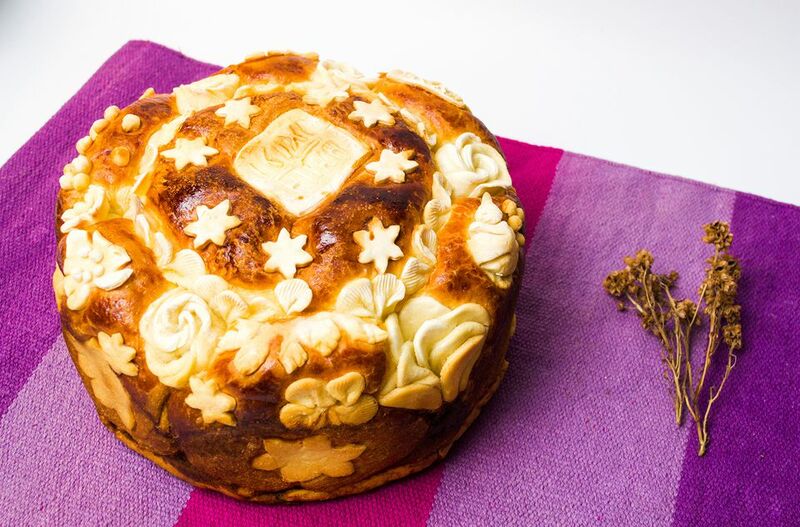 Slava bread or slavski kolac is an important part of the religious aspects of Krsna Slava or the celebration of a Serbian family's patron saint day. In many homes, the parish priest comes to the home to bless the bread before any festivities can begin. Dissolve yeast, sugar, and 3 tablespoons flour in 1/2 cup warm water. Set aside. In a large bowl, combine 1-1/2 cups warm water, salt, butter, eggs, lemon rind and juice, and sugar. Add proofed yeast and about 4 cups flour and beat well. Add remaining flour gradually, beating well, until dough is stiff. Knead as for bread, about 5 minutes by machine or 10 minutes by hand, and put in a greased bowl to rise. When double in size, knead again briefly. Reserving a handful of dough to decorate the top, make a round loaf. Put in a well-greased 9-inch round, 3-inch deep pan. Decorate the edge of the loaf with a braid and a cross in the center with 4 backward Cs in each quadrant. Let rise until doubled, about 1 hour, or follow this Quick Tip to cut the rise time. Heat oven to 350 degrees. Brush bread lightly with egg wash (1 egg beaten with 1 teaspoon water). Bake for 1 hour or until nicely brown. When cool enough to handle, remove from pan and cool on wire rack.